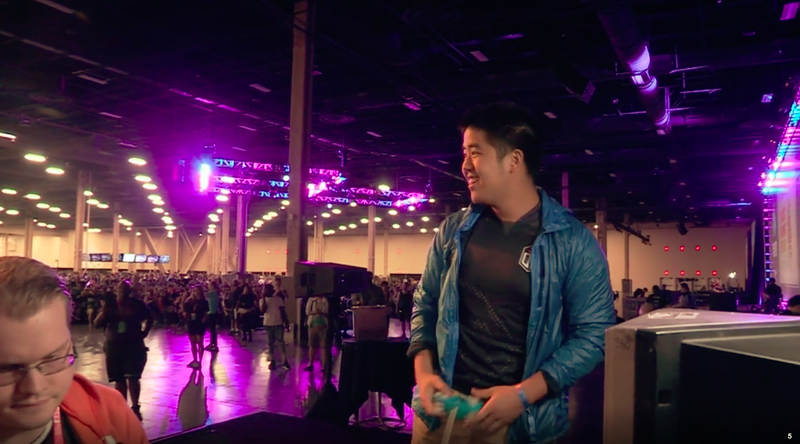 James “Swedish Delight” Liu grins at the standing ovation he earned from the Evo 2018 crowd after his shocking win. During a heated face-off with Swedish Delight’s Sheik, Armada switched characters in the final game to his old standby, Star Fox. The character switch didn’t help him, though. This is the first time that Armada has lost a game outside of a Top 8 since 2012. The shocking upset resulted in him fighting over 13th place with yet another of Melee’s “five gods,” the nickname for the players who have won every major Melee title for many years. His opponent there, fellow god Jason “Mew2King” Zimmerman, had been knocked into the losers bracket during pools by Rishi Malhotra, a longtime Melee player who has taken games off of Mew2King, Armada, and even Swedish Delight at past tournaments. Rishi’s win wasn’t as surprising, given his past wins against gods, but his victory did result in the unexpected 13th place match-up between Mew2King and Armada. Everyone expected to see these two greats duking it out during Melee’s Top 8 finals tomorrow, but nope. Although Mew2King did win one match, his off day was clearly going worse than Armada’s off day. By the final round, Armada had shaken off his loss and brought out a confident and almost saucy Peach, toying with his food before booting Mew2King from any chance at Evo 2018 glory. Armada still had one more Losers Top 8 qualifier match to clear before making it into the finals tomorrow, and he did it... just barely. At the end of that match, he put his head down on his chair for several seconds, looking exhausted. Swedish Delight also won his matchup in the Losers Top 8 qualifier, solidifying his placement in Melee’s finals in the arena tomorrow. And after his upset against Armada, this could be anyone’s game. But we do know who won’t be there to take it: Mew2King.